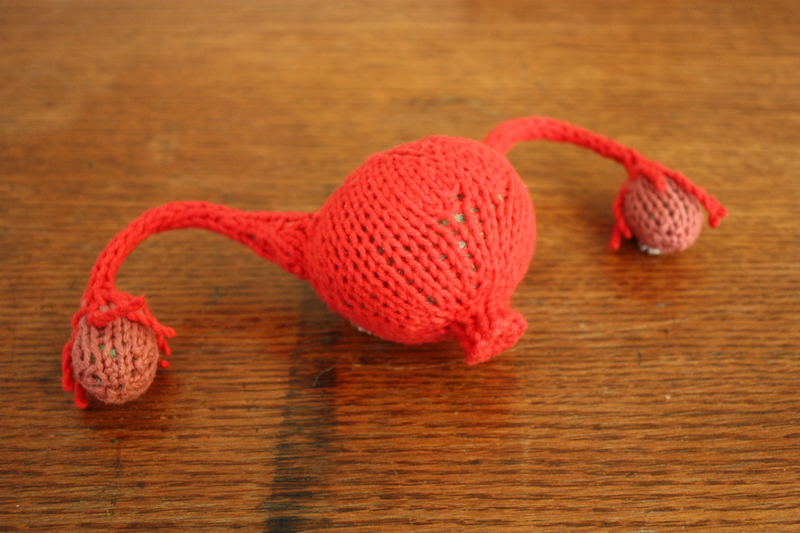 Today I think it’s time to share another knitting project for Rearview Fridays, 3 dimensional internal organs! I made them as costume pieces for a dance I choreographed last year called Organ Stories. The story of the dance itself will be one for another Rearview Friday, I have to upload some video and want to give the dance it’s due here. And these organs deserve their stand-alone own entry. 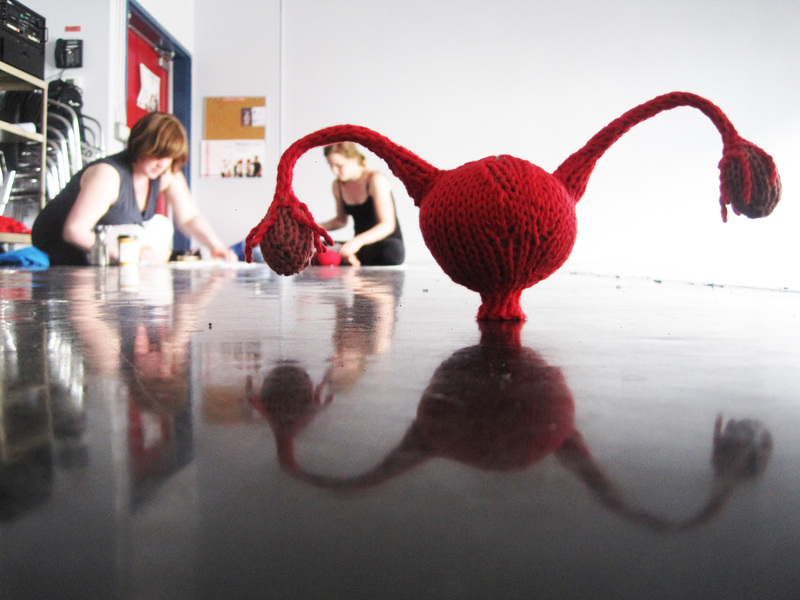 This first shot is of The Uterus, with me and dancer Krista Posyniak getting organised for a rehearsal in June 2011. I was super-duper pregnant with Gene! 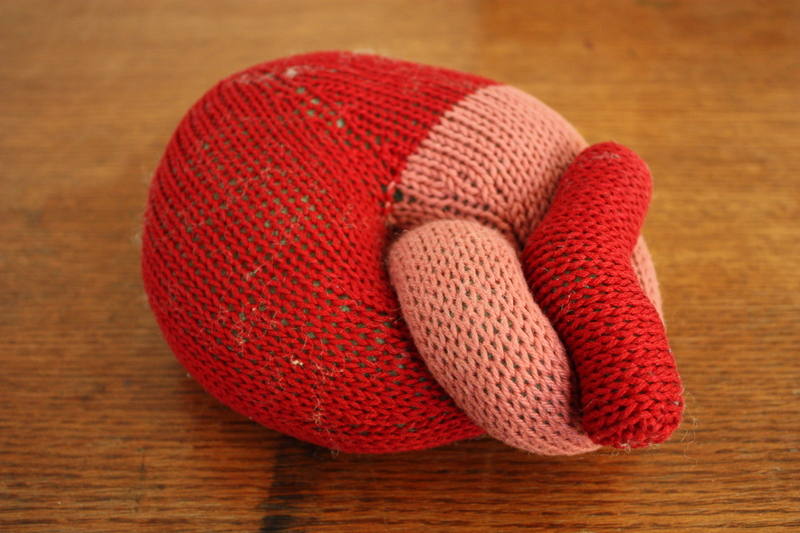 In 2009 I knitted an anatomical heart for my husband for Valentine’s day, which he thought was weird, but I also like to think he secretly loves that I do such things! I sought out a pattern online since I didn’t really know where to start and was amazed at all the anatomical patterns people had come up with. Here’s the heart pattern I used, it’s by Kristin Ledgett of The Knit Cafe in Toronto. I also knitted a heart that year for a wee boy named Ford, my friend’s son who was in hospital with complications from Hypoplastic Left Heart Syndrome. Sometimes when I’m at a loss when those I cherish are in a hard spot, making something is the only way I can think of to show my deep love. I pour my thoughts and goodness and hope into my hours of work, and I hope, I believe, that the object carries the weight of that love. Ford is no longer alive, but I’m glad my knitted heart sat beside him and his mom, who is so dear to me, for a while. So this piece is especially tender for me. I chose 4 organs that I’d make short solos about. The dancer spoke about facts and emotional associations of each organ and then danced a little organ-specific solo — like a lecture-demo on physiology through dance! 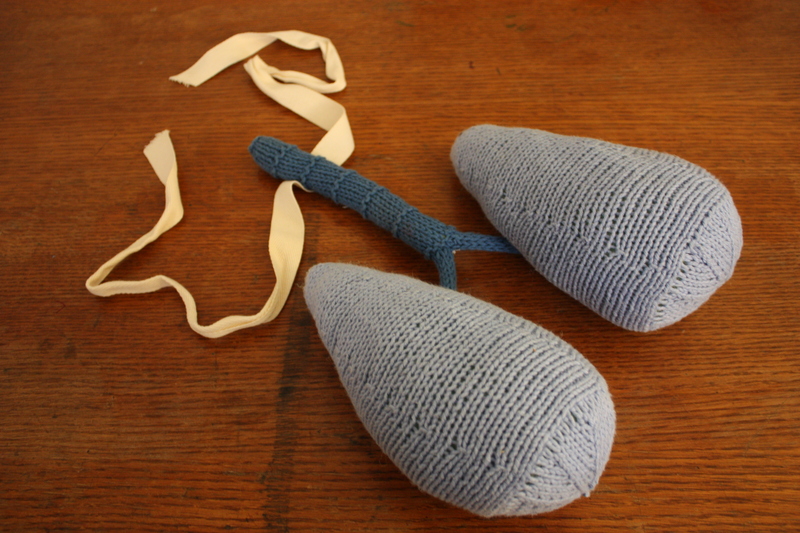 Here are the lungs, they tie around the neck and have super-strong earth magnets on the back that stick to a blouse with magnets sewn into it. I developed my own pattern from a few different ones I looked at online, but I didn’t write it down since I modified as I went, argh! Ah well, there’s next time. This one made me giggle as I made it. And it was great when people would ask me what I was making, particularly because I was obviously pregnant while I was knitting! It was a highly appropriate organ to be knitting in my condition. I worked directly from a lovely, easy to follow pattern on Knitty by MK Carroll. I’ve also made this as a gift for my midwives, the lovely ladies that saw my boys into the world. Best midwife or obstetrician gift ever! 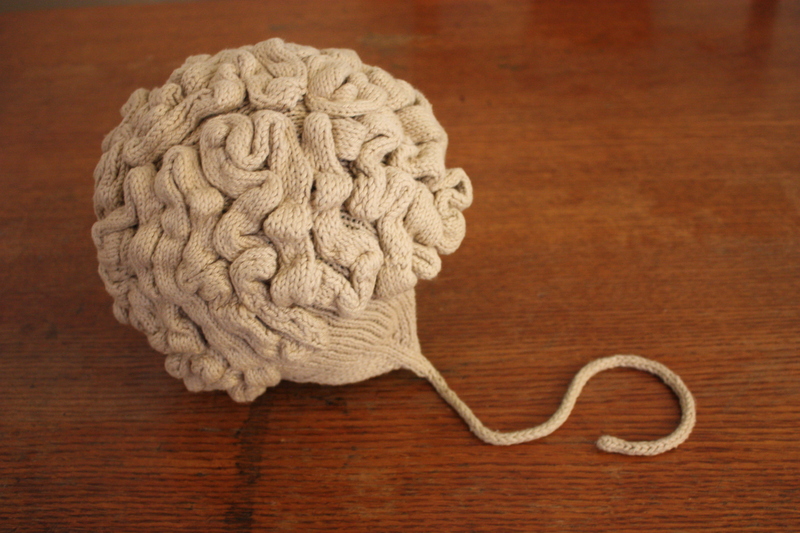 The Brain I concocted myself. I used a great little Blue Whoville Hat Pattern as a base, though I modified a lot of things, made it bigger, alternated knit and purl for the earflaps so that they’d be more smooth than the original and did away with the ribbed band in the original. This photo by Andréa de Keijzer, the dancer is Krista Posyniak.